Introducing a splendid new annual resource for deepening prayer—in the tradition of our best-selling Advent/Christmas and Lent annual reflection guides! There is no better season to renew one's relationship with God than Easter, the most joyful days of the church's year. Rejoice with these inspiring reflections on the daily Mass readings. 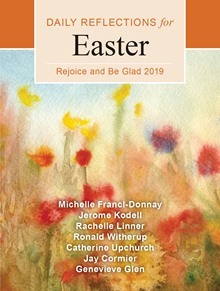 In just minutes per day, the insightful meditations of Rejoice and Be Glad can help you embrace, live, and share the good news of the great Easter mystery. Michelle Francl-Donnay is a writer, teacher, wife, and the mother of two college-aged sons. Her regular column, Catholic Spirituality, appears at the Philadelphia Archdiocese's news site, CatholicPhilly.com. She is a professor of chemistry at Bryn Mawr College and an adjunct scholar of the Vatican Observatory. She blogs about faith and science at http://mfrancldonnay.blogspot.com/ and is a contributor to Give Us This Day, and author of Not by Bread Alone 2018 published by Liturgical Press. Jerome Kodell, OSB, is a monk of Subiaco Abbey, where he has honed both his biblical scholarship and his leadership skills as the former abbot. He is a contributor to Give Us This Day and the author of several books, including Twelve Keys to Prayer; Don't Trust the Abbot: Musings from the Monastery; The Eucharist in the New Testament; John the Baptist, Forerunner; Barnabas, Man for Others; and co-author of Waiting in Joyful Hope 2015-16 with Genevieve Glen, OSB. Rachelle Linner, a freelance writer and reviewer, has a master of theological studies from Weston Jesuit School of Theology. She is a librarian by training who recently retired from a career as an editor in software companies. In May 2019 she will complete a two-year Franciscan Spiritual Direction certification program. She is a frequent contributor to Give Us This Day. Ronald D. Witherup, PSS, is superior general of the Sulpicians, an order of diocesan priests dedicated to initial and ongoing formation of priests. He holds a doctorate in biblical studies and is the author of numerous books and articles on Scripture, including The Word of God at Vatican II: Exploring Dei Verbum, and Biblical Fundamentalism: What Every Catholic Should Know, published by Liturgical Press. He is also a contributor to Give Us This Day. Catherine Upchurch serves as the director of Little Rock Scripture Study and the general editor of the Little Rock Catholic Study Bible. She brings years of adult faith formation experience to her writing and speaking. She is an associate editor of The Bible Today, a regular contributor to Give Us This Day, and the author of Christmas, Season of Wonder and Hope; Mary, Favored by God; Moses, Called and Equipped; and Hospitality, Welcoming the Stranger. Jay Cormier is a deacon and editor of Connections, a monthly newsletter for homilists and preachers. He is an adjunct professor of humanities and communications at St. Anselm College in Manchester, New Hampshire, and leads preaching and liturgy workshops for clergy and laity. Cormier has contributed to America, U.S. Catholic, Worship, and Give Us This Day; and is the author of The Deacon's Ministry of the Word; the 2012 and 2013 editions of Waiting in Joyful Hope: Daily Reflections for Advent and Christmas; and previous editions of Living Liturgy (Liturgical Press). Sister Genevieve Glen, OSB, is a nun of the contemplative Benedictine monastery of St. Walburga, where she has taught in the formation program and conducted retreats in the retreat house. She has also given retreats in many Benedictine monasteries of women and men. She is a poet, hymn text writer and essayist who contributes regularly to Give Us This Day. She co-authored the 2016 issue of Waiting in Joyful Hope with Jerome Kodell, OSB, and is the author of Not by Bread Alone 2017, Waiting in Joyful Hope 2018-19; and Sauntering Through Scripture: A Book of Reflections (2018) published by Liturgical Press. *Asterisk indicates discount price available only on "no-returns" basis. No further discounts apply. Fifty days of feast follow forty days of fast. But how can you prolong the spiritual benefits received in Lent throughout all of Easter Time? Rejoice and Be Glad offers meditations on the readings from daily Mass, reflection questions, and prayers. With this book you may feast on God's word during each day of glory from Easter to Pentecost.